Respected journo Paul Kent mentioned that a succession plan is needed to avoid a catastrophic dilemma, one that the Australian Cricket team was faced with it when the likes of Warne, McGrath, Langer and Hayden went sailing off into the sunset. This viewpoint was only exemplified by media commentator Phil Gould who harped on and on and on during the broadcast of last week’s ANZAC Test, virtually sighting the loss to New Zealand due to the age of the Australian team. Some have even suggested that because the Kangaroos do not play another test match or have a representative schedule post the premiership season this year, a large bulk of the Australian team may have pulled on the green and gold jersey for the very last time. Justin Hodges, who only a week before the test side was announced declared the 2015 would be his last year of representative football, wanting to devote all his time, effort and energy into his club side, the Broncos only to be overlooked by the selectors which suggests he is the first casualty of this apparent ‘changing of the guard’. Parker Thurston, Smith, Lewis, Slater, Cronk are all on the wrong side of 30. Thaiday Scott, Myles are all on the cusp of 30. All are in great form for their respective clubs. Thanks to the evolution of sport science and the emphasis upon recovery and rehabilitation, these players are at the physical peak of their powers when it comes to being fit, healthy and defying the odds of being washed up and over the hill. All players are still competing as well as they did 5 years ago, some even better now then back then. Players are now athletes. They are able to play longer than ever before because of the advancement in technologies, data and training systems. As clichéd as it may sound, age truly is a number in the modern day game and sport in general. The likes of Steve Price, Petero Civenoceva, Darren Lockyer played past the age of 34. Current NRL players in Willie Mason and Jeremy Smith are 35 and 36 respectively who are still looking and playing beyond the 2015 season as is current Sharks enforcer and NSW Origin Captain Paul Gallen who is embarking upon blowing out 34 candles on his next birthday cake. So was it age that saw the Kangaroos beaten comprehensively by the Kiwis? If you believe the likes of Phil Gould and Paul Kent then yes it was. The game was over before Australia had walked onto the field at Suncorp Stadium. Or perhaps it’s a case of not giving New Zealand enough credit and respect on what was a clinical performance, a performance that would have resulted in the Kiwi’s shaming any opponent on the day, young or old. Triple MMM and Fox Sports commentator, former Test and Origin forward Gorden Tallis believed that age was not a factor. He cited the 2014 Four Nations campaign as an example, where Australia blooded a heap of young talent only to be beaten by New Zealand twice in the tournament, including the final, suggesting that the Kiwi’s were the new benchmark in International Rugby League and it would make little or no difference at all if a new look or current Australian team was assembled to take on the Kiwis. Tallis’ comments were echoed by Nathan Hindmarsh, believing that the performance was more down to a poor display and errors rather than age. Hindmarsh’s assessment was backed up by his Fox Sports co-hort Bryan Fletcher who suggested that if the Kangaroos were to play the Kiwis again next week, the result would be different. St. George Illawarra pivot and former NZ Kiwi’s captain Benji Marshall slammed the comments that age was a factor, coming to the defence of his Australian rivals saying age should not dictate as to whether a player should forgo representative jerseys or be tapped on the shoulder, saying “if they are still able to compete at that level and their form warrants selection” then that should be the only thing considered. 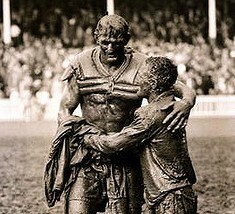 With the 2017 Rugby League World Cup less than 3 years away, it is only natural that there will be a changing of the guard, but let’s not throw the baby out with the bath water. If a fit, competitive Jonathan Thurston, Cooper Cronk and Cameron Smith are still at the top of their games, why should they be overlooked or told that they are too old? Their experience will be hard to come by, especially considering they will be surrounded with youth who will need guidance when it comes to handling the pressure and expectation of international and representative football. Current QLD Origin coach Mal Meninga has refuted the call to move on some of his ageing Maroons, instead saying he will back his veterans to get the job done as they have earned the right to play in the 2015 Origin series and beyond if they are still contributing but trusted the players to know when it was the right time to opt out of the program that they have all made a success over the past decade. The emerging Origin squad program which has been in effect since 2006, coupled with bringing in a different 18th and 19th man to each Game of the series to expose them to the Origin environment that has seen Queensland already embark upon a transition or succession plan. The likes of Cherry-Evans, Taylor, Chambers, Guerra, Gillett, Papallii are all an example of the next generation who have come through. In 2015 Brisbane prop Josh McGuire and Newcastle centre Dane Gagai look to join the new young brigade of Maroons, both set to feature at some stage during them series. These players will join the likes of those listed above and will no doubt, contribute alongside the nucleus and staple veterans as QLD aim to secure back the Origin Shield, the Shield they may have not lost, if one of those supposed ageing players in Cooper Cronk had not broken his left arm in the 7th minute of Game I last year, signifying the importance of the Melbourne Storm maestro to the QLD side who suffered from not having his game management and directional sense. So the pressure, the curtain call, the notion around axing players who are perceived to be done and dusted, not up to representative standard because they all of a sudden are ‘has beens’ due to their biological age, in a one off test is the agenda being set and pushed by journalists and media commentators for personal opinion or to push another players ‘barrow’ because they believe other individuals are deserving of playing higher honours, the honours that the current Australian representative players currently have a hold on who were once waiting in the wings, stuck behind former greats who wore the Green and Gold. No one can play forever, the current crop of rep stars know that, but surely they have earned the right to bow out on their own terms rather than be forced or told to move on by a few self absorbed individuals behind a TV Camera or computer screen. As for the Australian Cricket team analogy, one thing that separates Rugby League from Cricket and every other sport is the endless production line of talent. The succession plan will take care of itself, in the mean time, let us continue to marvel and watch in awe of the best, current representatives who still have so much more to give. If only these self-opinionated media types gave the same respect and support they once gave to the likes of Daley, Stuart, Lockyer, Johns, Burderus, Fittler etc. the respect the current playing group should be entitled too, should be receiving and are deserving of. Let form, let fitness but above all, let the player decide when it is their time to walk away.